Nestled on the shores of Boston Bay, Port Lincoln is one of South Australia’s most picturesque regional cities. It enjoys a reputation as the ‘Seafood Capital of Australia’ with most seafood varieties caught in and around the township. Be sure to sample some of our famous seafood at one of our many eateries. Better still, match our seafood to one of our excellent wines from our local wineries. There is no shortage of things to see and do whilst in Port Lincoln. 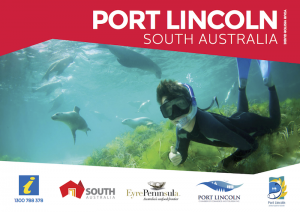 Whether your preference is for water based or land based activities, you are sure to find a unique Port Lincoln based activity to suit your desires. Some images provided courtesy of the South Australian Tourism Commission and Adventure Bay Charters. Surf at one of our easy accessible local surf beaches. Visit our beautiful national parks, the Port Lincoln National Park or the Coffin Bay National Park. Experience a range of amazing local sights on a guided tour around the area with Goin’ Off Safaris. Enjoy a morning coffee and breakfast at Del Giornos waterfront café. Take the children for a fun filled day with local wildlife at Glen Forest Tourist Farm. Spend an afternoon wandering around the impressive Axel Stenross Museum. For a trip back in time, be sure to visit Koppio Smithy Museum. Take a twilight cruise onboard the electric boat in the Port Lincoln Marina. Take a daytrip to Coffin Bay including lunch at the 1802 Oyster Bay and Bistro. Aquaculture tours and fishing charters – try Triple Bay Charters or Kathryn M Charters. Go for a tour through The Fresh Fish Place, Port Lincoln’s first stop for the best local seafood. Cooking classes are also available so check out their website for times. You can experience all these and more during your stay with us at Bay 10, so book now and base yourself right in the heart of Port Lincoln. For all other info on things to do please call into the Port Lincoln Visitor Centre or call 1300 788 378. PS Regular tours etc are posted on our Facebook page so be sure to join the Bay 10 family on social media.